Fruity tender raisins in a wafer-thin layer of gently melting whole milk chocolate. Raisin, sugar, MILK, cocoa mass, cocoa BUTTER, WHEY, glazing agent: E414, glucose, vegetable oil, SOY lecithin, flavor, glazing agent: E904, citric acid, preservative: E200. May contain traces of PEANUTS and NUTS. Selected fruity raisins covered with tempting and aromatic whole milk chocolate - that's our CHOCO MILKS RAISINS! Traditionally, raisins have been used in many sweet and salty dishes, giving them a uniquely sweet and fruity taste. Nowadays, you have a bag of our chocolaty temptation on you to get that unforgetable flavour anytime! Not every raisin gets to be a CHOCO MILK RAISIN - we want only the best. That's why they have to be full and ripe, with plenty of pulp. Only then we grant them a sweet bath in our gently melting whole milk chocolate in order to get a simple but irresitable combination that will raise your spirits! 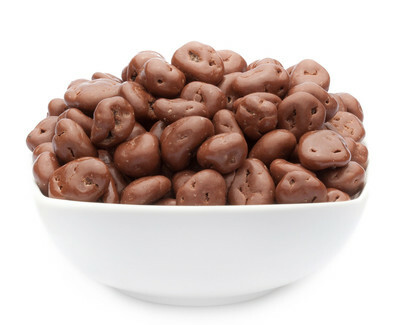 It's probably because of the high-quality and distinctive aroma of whole milk chocolate why raisins feel so comfortable in the centre of this sweet snack. Sensually soft, they linger in the proctective cover of delicious darkness - until somebody can't resist them anymore and joyfully devour them without hesitation! A fruity delight!